Basically an excuse for lovers of cheddar cheese everywhere to essentially drink melty cheese. Beer and smoky bacon add depth. In a large skillet over medium heat, cook bacon until crisp, 6 minutes. Transfer to a paper towel-lined plate to let drain, then crumble. Heat skillet with bacon fat over medium heat. Add onion and cook until soft, 6 minutes. Add garlic and cook until fragrant, 1minute. Add flour and whisk until golden, 3 minutes. Add broth, milk, and beer and let simmer, 15 minutes. Add cheese and stir until melted. Season generously with salt and pepper. Stir in most of the crumbled bacon. 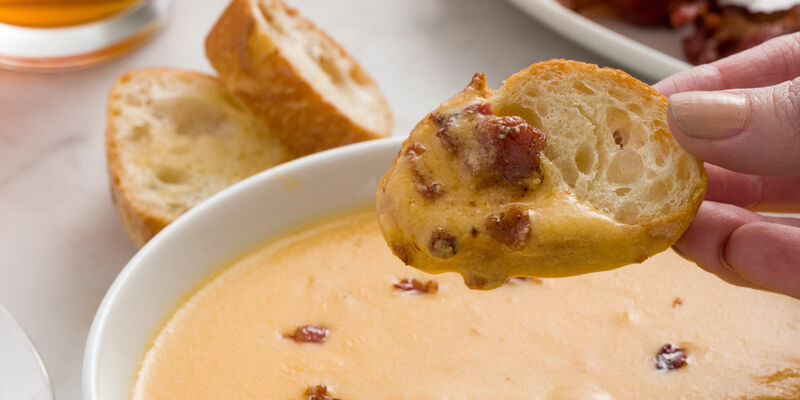 Ladle soup into bowls and top with remaining bacon. Serve with bread.